Why do we consider our nicotine cessation program more effective than other Stop Smoking Laser methods on the market? We are not a "Zap and Go" center. Part of our service is providing guidance and Support. Eileen and Sheldon who operate the Anne Penman Laser Center in Las Vegas (since 2005) are both former smokers and understand both the addiction and the habit. "We didn't just learn this in some technical manual, we lived it !" Watch this Anne Penman laser therapy videos to learn about your opportunity to stop smoking once and for all. A reflection of the program's success is that a large percentage of new clients come from personal recommendation (many from Doctors and Cardiologist as well). We offer Three Complete Laser Treatments and our follow up Laser Treatments are not so-called "boosters". They are full and complete Laser Treatments. The Anne Penman Center is open 7 days a week and have a 24 hour help-line. Your success is our success. We opened our Anne Penman Laser Therapy Center here in Las Vegas, Nevada in May of 2005 and they are now located throughout the world. When you call a certified Laser Therapy Technician, "Eileen or Sheldon" will answer all your questions, not the receptionist. You will see why your care is the best. Cigar and pipe smokers, chewers, dippers, smokeless tobacco, dip, snuff, snus, Vapor, Vape, electronic or e-cigarettes. The Anne Penman Stop Smoking Treatment is the most advanced Laser Therapy for Smoking Cessation. Three complete Laser Treatments. "not so-called "boosters"
We treat former "Laser Concepts of Nevada, Stop Smoking Now and New Beginnings Smokers"
The Anne Penman Program was developed by Anne in 1992. Her center in Glasgow, Scotland was the first Laser Treatment Center to help smokers kick the habit. She has successfully treated long-term smokers give up cigarettes permanently from all walks of life. Anne and her husband Ron were both 60 a day smokers for +20 years and understand the difficulties to quit first hand. Ron suffered a major heart attack when he was just 39 and was hospitalized for 12 weeks and resulted in a triple bypass. This was the final wake up call for Anne and after trying all the methods available at that time, she discovered Laser Therapy for Nicotine. We are happy to say Ron has been smoke-free ever since. Anne quit her 60-cigarettes-a-day habit on the 19th of April 1991. She quickly developed a passion to help other smokers who felt as hopeless as she had and in 1991 began to research Laser Therapy. She trained as a Laser Therapist Technician and began to research and develop her own program. Over the past 21 years she has used her own personal experience and that of her clients to continually improve the content of her program. Anne Penman Laser Therapy Centers are now located throughout the world. 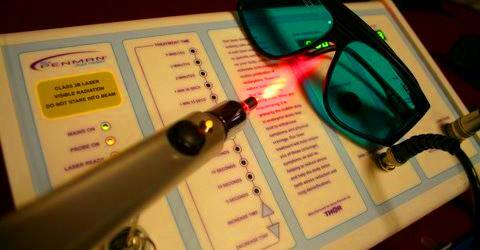 All laser therapy technicians are trained and certified by Anne Penman. Our Las Vegas Laser team will work hard to help you make your transition into a non-smoking lifestyle as trouble-free as possible. We are committed to helping you stop smoking. A reflection of the program's level of success is that a large percentage of new smokers come from referrals. After your initial treatment you can be assured that you will leave feeling fully prepared to remain a non-smoker. Andrea's passion and patience to help you quit smoking, could change your life! The laser treatment involves the application of a cold, soft, non-invasive laser beam to specific energy points on the body. This treatment is completely safe and painless. This will help stimulate the release of endorphins, the body's natural chemical, which deals with the relief of pain and stress. Nicotine releases a high level of endorphins which give the smoker a sense of relaxation. When smoking stops, the sudden drop in endorphin levels leads to withdrawal symptoms. Low-level Laser Therapy Treatment helps reduce the craving, stress, and restores balance. Note: For those concerned about weight gain we will treat your appetite suppression points at no extra cost so that you won't "eat the furniture". The combination of our cold-laser therapy sessions coupled with on-call advice and support is a highly effective and proven method that has helped thousands of people safely break their addiction to nicotine. Through tracking our success rate (And we do track it. ), we have found that after one year, clients have been up to 7 times higher in their success level than by other methods. There are more than 50 million smokers in the U.S. and only a handful of solutions to help break their habit. As everyone reacts differently to stopping smoking, our program is tailored to your individual needs. This means that regardless of how many you have smoked and for how long, the program can help you achieve your goal. We take the time with all our clients. * Refer five smokers and we will return your stop smoking fees. 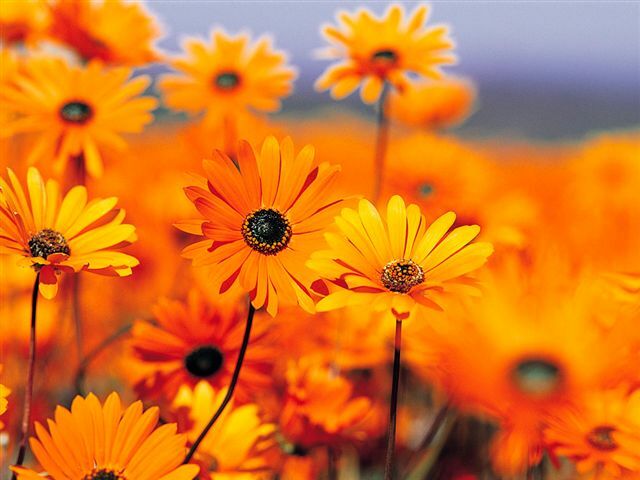 Guidance advice is based on the client-centered motivational model which focuses on self-belief and positive thinking. During the treatment we will help you deal with the emotional, physical and psychological aspects of quitting smoking. Our help-line is available 24 hours a day, 7 days a week to provide ongoing support to secure lifestyle changes and help clients remain smoke-free. OPEN 7 DAYS A WEEK. Woman who take oral contraceptives and smoke increase their risk of stroke by many times. Cigars, Chew, electric Cigarettes, Vaping and pipe smoking are not a "safer" alternative to cigarettes. People who smoke cigars or pipes have a higher risk of death from coronary heart disease and stroke. E-Cigarettes and Vapor lead to the incurable disease called "Popcorn Lung". Hosted by former super model, entrepreneur and smoking cessation advocate Christy Turlington. This 17-​minute video explores some of the common myths about smoking and empowers women and men to become or stay smoke-​free. The Center for Disease Control produced this informative anti-​smoking video. (msn.com HealthDay News) -- Knee and hip replacements are more likely to fail in smokers than nonsmokers, according to two new studies. A study of 621 patients, including 131 smokers, who underwent total knee replacement found that the rate of knee-replacement failure was 10 times higher among smokers than nonsmokers -- 10 percent vs. 1 percent. Smokers also had a higher rate of medical complications than nonsmokers -- 21 percent vs. 12 percent. Complications included blood clots, anemia, heart problems and acute kidney failure. The studies were presented recently at the annual meeting of the American Academy of Orthopaedic Surgeons in San Francisco, which also included a forum on smoking and joint replacement. "First, ask about tobacco use," Hurt said in an academy news release. "Have your receptionist ask, your nurse ask, your physician's assistant ask, and you ask -- even if you already know the answer. Asking shows the patient that smoking is a serious problem that must be addressed. Then, advise the patient to stop smoking. Don't just say, 'you know, you ought to consider stopping someday.' Tell the patient, 'you need to stop smoking.' Finally, because smokers are going to push back, it's important to offer help." Smoking is the single most preventable cause of death in the United States. Tobacco smoke is one of the six major controllable risk factors for heart disease (along with high cholesterol, high blood pressure, diabetes, being overweight and physical inactivity). If you smoke and have high cholesterol, you have two major controllable risk factors you need to work on. Exposure to other people's smoke increases the risk of heart disease even for nonsmokers. Higher levels of HDL (good) cholesterol may reduce your risk of heart disease, but smoking has been shown to lower HDL (good) cholesterol levels. Smoking also decreases your tolerance for physical activity, making it harder to get the activity you need to help you reach healthy cholesterol levels. The good news is that when you stop smoking — no matter how long or how much you’ve smoked — your risk of heart disease and stroke starts to drop. It’s cut in half after one year without smoking, then continues to decline until it’s as low as a nonsmoker’s risk. And if you don't smoke, avoid exposure to second hand smoke.. The negative effects of smoking are well-known, from lung and other cancers to heart disease to stroke to bronchitis and emphysema. The benefits of quitting are well known too including: longer life span, decreased risk of cancers and lung diseases, and lower costs. The Truth About Second-hand Smoke An estimated 38,052 nonsmokers die from coronary heart disease (CHD) each year as a result of exposure to environmental tobacco smoke. Exposure before and after birth puts children at a greater risk of abnormal blood pressure, cleft pallets and lips, childhood leukemia, attention deficit disorder and childhood wheezing. Secondhand smoke is a known cause of Sudden Infant Death Syndrome (SIDS), acute lower respiratory tract infections, asthma induction and exacerbation, chronic respiratory symptoms and middle ear infections in children. In adults, exposure increases the risk of lung cancer, nasal sinus cancer, heart disease mortality, acute and chronic coronary heart disease morbidity and eye and nasal irritation. A 1997 analysis found that lifelong nonsmokers living with smokers had, on average, a 24 percent higher chance of contracting lung cancer than those living with nonsmokers, and that those exposed to the heaviest smokers for the longest time had the highest risks. Each year, 150,000 to 300,000 children younger than 18 months of age have respiratory tract infections because of exposure to secondhand smoke. Anne Penman Stop Smoking article here: The champagne has run dry, the great ball has dropped, and the party is long since over. The year 2006 is now upon us, and therefore it's time to embrace our New Year's resolutions. If you are like some 22% of Americans, you've promised to make 2006 the year in which you finally quit smoking. 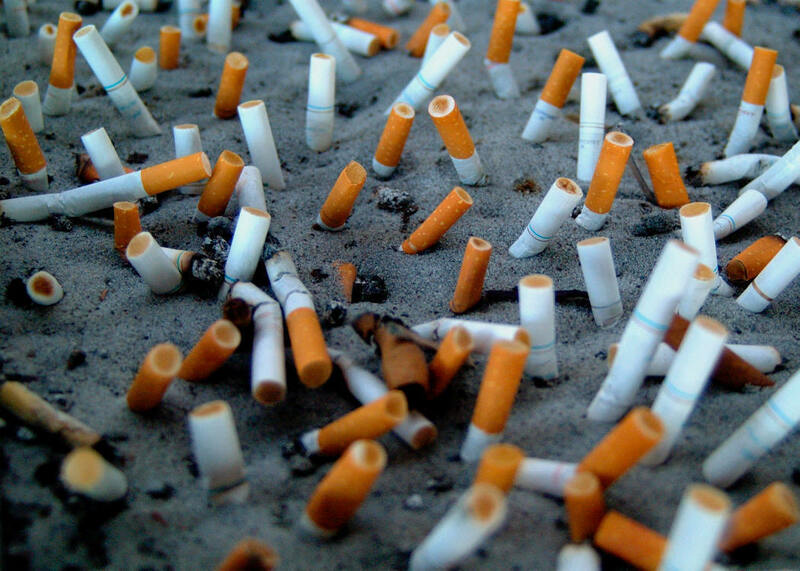 Unfortunately, for many smokers this is not the first year that they have resolved to kick the habit. Smokers all around the world are quitting smoking by zapping the habit using cold laser therapy as a modern form of acupuncture. In fact, the success rates are four to five times that of most other smoking cessation programs. Stephanie Stahl, Medical Reporter for CBS3 out of Philadelphia, recently featured this new technology to rave reviews. According to Stephanie, "Other than the treatment not working for everyone, there are no downsides to the laser, as long as it is used by a trained technician". 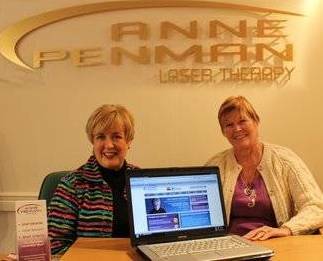 The Anne Penman Method combines laser therapy with customized guidance and a 24-hour hotline. The laser technician uses a "cold" laser beam to target energy points on the body. Focusing the laser beam on these areas causes the body to release natural chemicals called endorphins. Endorphins have a calming, relaxing effect on the body that helps to reduce nicotine craving and withdrawal symptoms. Some laser therapy clients report a feeling of euphoria following a smoking cessation treatment with the laser. In addition to stimulating an endorphin release, the laser stimulates the body's natural ability to detoxify the nicotine, getting the ex-smoker through the nicotine withdrawal more quickly. 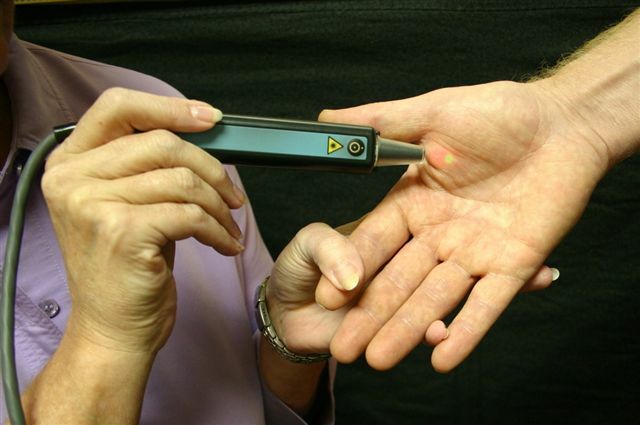 While there are other organizations in the United States that offer laser therapy for smoking cessation, the Anne Penman organization is the most established and has treated close to 40,000 clients over the last 13 years. In August of 2005, the Anne Penman organization was featured on "Good Morning America", where Anne Penman declared a 64% success rate in helping people quit smoking. 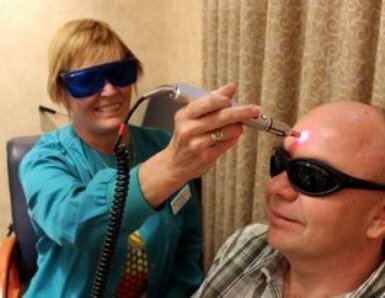 While there have been no formal studies conducted on the effectiveness of laser therapy to help people quit smoking, the low level laser therapy is currently in clinical trials through which it plans to soon receive FDA approval. Did you know that Nevada ranks 3 among the states in the percentage of the population that smokes?